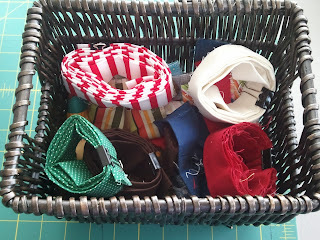 Sew Festive Handmade: Organizational Saturday! I grew up in a family of extreme organization. I am not that on top of things now that I have my own place. Mainly because we have more stuff than we have space. Also, I haven't been able to get too many nice organizational items to make sure that everything has a home. Still, I do what I can. Small shelves. Nice baskets. Glass hurricane jars. These are things that I can do. 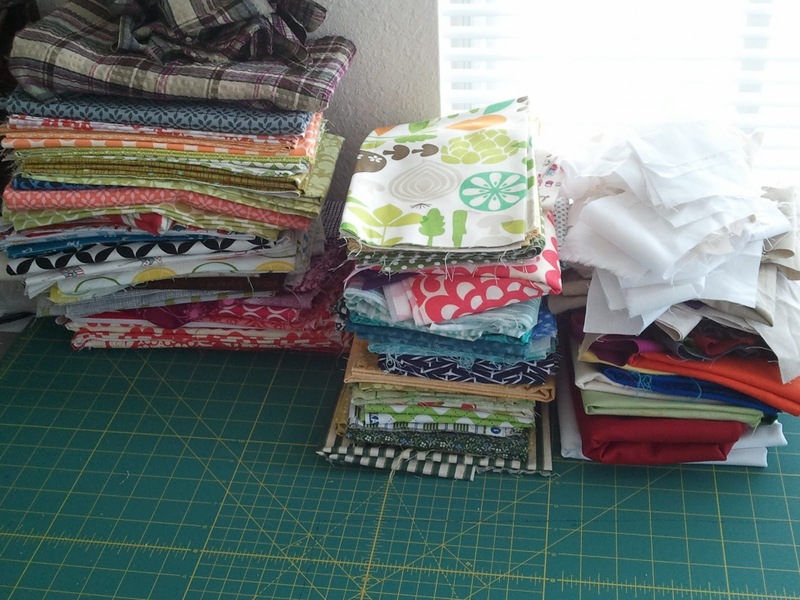 My sewing space, despite being less than a month old, was in need of better organization before I could continue working. Especially since I've been cutting out patterns. I need a clean surface. So I purged. Very traditional fabric that I inherited from my Oma [German for grandma, for those who don't know]. 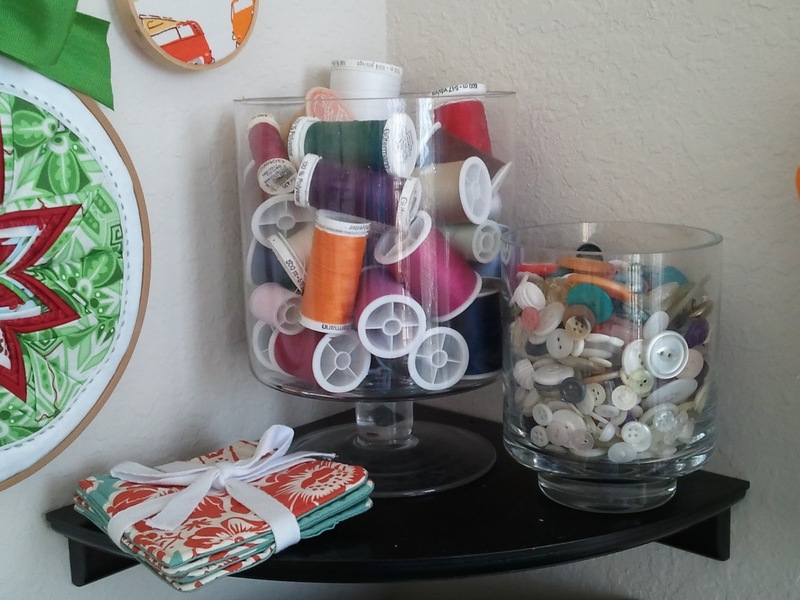 Spools of thread that were just about empty. Random junk. I threw away a whole plastic bin of junk! Yay! 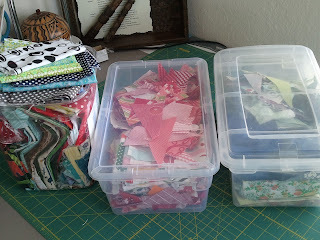 I also organized my grandma's sewing box and am airing out her sewing bench so I can store things in there. My corner is slowly growing! 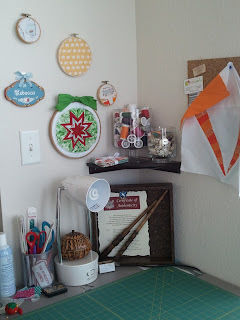 I put up a little corkboard [where my Tangerine Tango Challenge piece is pinned up for now]. I changed out the stuff on the corner shelf. My scraps got a new home: on the left, a recycled Twizzler container holding pieces that are considered big scraps, like fat-eight size, but less than a FQ; warm scraps; cool scraps [the plastic bins are $1 at Home Depot]. I store these under my table where it overlaps with the back of my couch. 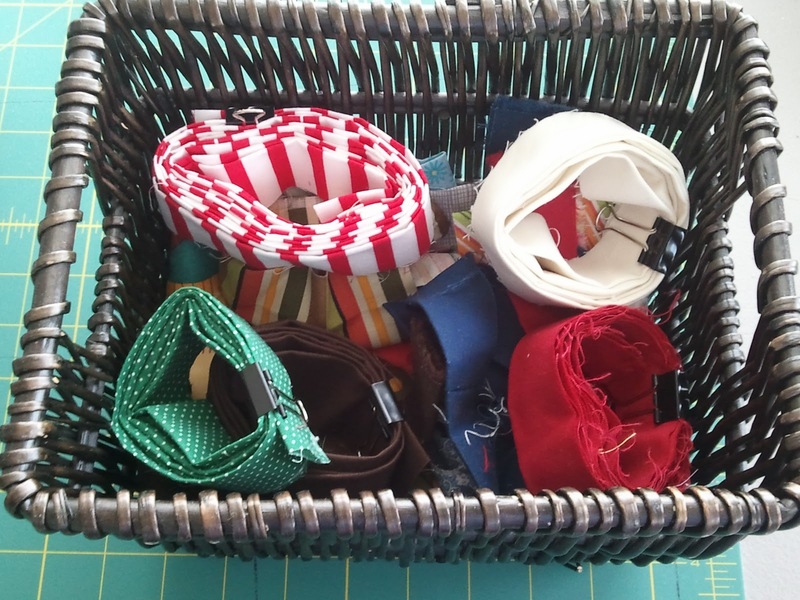 This basket now holds leftover pieces of binding from various projects. The longer pieces are held together in a coil by a binder clip. Your space looks really great. I love your button collection, I'm trying to get my grandma to pass her buttons on to me :-) I've been working on my sewing space too. I threw out a ton, and it felt so good! 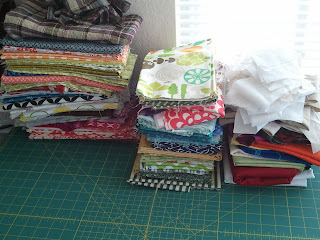 When I finish, it will hopefully look as neat and organized as yours! 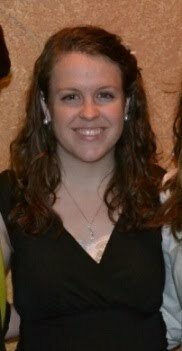 Totally jealous of your organization! My stuff is all over the place, especially since moving everything around I haven't gotten to re-organize yet. I'm usually not a fan of doing the actual organization, I have to really be in the mood then go for it, once I do I do feel much better about life though! love you binder clip trick! !